Two year ago today, I launched DMT Artistry, LLC. I’d like to think this just gave you goosebumps, but I’ll settle for an involuntary gasp. The first anniversary breezed by with barely a “huzzah”. I was too engrossed in “figuring things out” to put much stock in a 1-year milestone. But with a second year securing my faith in what DMT Artistry stands for, it’s quite definitely time to celebrate an increasingly successful go-round of entrepreneurial adventure. This business represents a decision to make creative thinking the focus of my life and career; to see projects as a quest, rather than an assignment; to connect with fellow business owners at the level of a peer; to think big and build bigger; to manage, rather than be managed; to DO. This is the kind of day that needs to be celebrated with others… with YOU. So I invite you to step back from your daily “to-do”s for a moment, throw your proverbial doors and windows open with (intelligent) abandon and bask in the “big picture” of what you’ve accomplished and where you are going. Remember, it took vision to lead you forward. It took integrity to build a reputation of reliability. It took courage to face the challenges. It took humor to pull you through. And it took cornering the market on elbow grease to make it all come to fruition. You had a choice, and you chose action. Bravo. Well done. $500,000 into your advertising campaign, you’re pulling your hair out. Where are the scores of eager buyers who desperately need what you sell? Why aren’t they responding to your message? Looks like you’re suffering from a bad attack of zombie advertising! It devours your budget and scares people away without contributing anything to your bottom line. It’s time to make a move before your campaign saps the life out of your business! 1) Location, location, location. Who is your target audience, and where do they go? Do they frequent the web, devotedly read the paper, live at the coffee shop? Are they constantly driving, addicted to their smart phone, an avid e-mailer? That’s where your business needs to be. Zombie advertising happens wherever it’s cheapest, coolest or most convenient to advertise. Forget that. Advertise where your target market is most likely to see you. 2) Judge a book by it’s cover. First impressions count when you potentially have just one shot to make an impression. Zombie advertising creates ads based on, again, what’s cheapest, coolest or most convenient. But what’s appropriate for your target market? “Caviar”-style advertising is fine, if your target market is elite, high income individuals, but may not mean much to a high school freshman. 3) I’m sorry… have we met? Today’s consumers are wary of nebulous, generic advertising … it’s too much like the Wizard of Oz hiding behind a curtain and blowing a lot of hot air. We want to relate on a human-to-human level, so that we know just who we’re buying from. Zombie advertising has a corporate, impersonal feel, and lacks personalization. That won’t fly today. Be unique. Be warm. Be human. 4) Huh? I don’t get it. Don’t talk over your potential customers’ heads. Zombie advertising assumes everyone’s an expert. News flash: we’re not. Shoot for making your advertising understandable, without being condescending. 5) Isn’t that nice. A pretty ad doesn’t mean a sure sale. 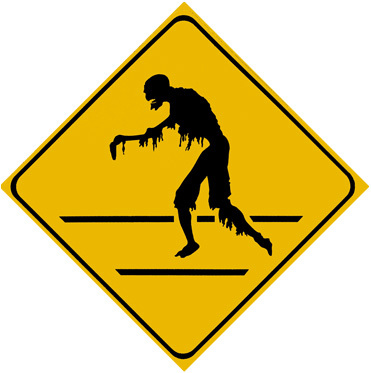 Zombie advertising makes a momentary impact, without giving potential customers a reason to follow up. Give people a call to action and, when possible, a deadline to act. A little urgency, and a direction to take, will go a long way toward reviving your stagnant campaign. What actions have you taken recently to bring your advertising campaign back from the dead, or to keep it in a zombie-free zone? When Lori Wengle lost 107 lbs, it understandably changed her world. How do you go from obese and apathetic to slim and feisty without rocking your very core? But while most weight loss success stories are content to quietly enjoy their hard-earned gravity lift, Lori set off on a mission to astonish others with their own ability to transform. If you glean one business tip from this petite powerhouse’s story, let it be to diversify. Lori owns Livingston Antique Outlet and Change Your World Fitness, published “The Fat Princess No More”, invented Personal Trainer in a Box, blogs, trains, speaks… her business acumen is surpassed only by her boundless energy (oh, to be fit!) and her compassion. And the benefit of putting your eggs in a whole slew of baskets? If one part of your business is dragging, another is taking off, while yet another just might be your ticket to super-success!